It has been two years since the little mutant in the Mutant Enemy logo graced a screen, the small screen. It’s back and it’s on the big screen, which is great to see. From the moment The Cabin in the Woods starts, it doesn’t begin like a typical horror movie with the introduction of the potential victims the protagonists. This movie begins like it does because it is written by Joss Whedon, creator of the television series Buffy the Vampire Slayer, Angel, Dollhouse, and Firefly and Drew Goddard, who wrote for both Buffy and Angel. They threw out the rule book because they don’t follow the rules. They want to be original. Whedon and Goddard fans know this. The movie starts with Richard Jenkins (Six Feet Under) and Bradley Whitford (The West Wing) in an underground location just having a conversation about consequences and a certain “scenario.” They could be two business men or friends just talking until Whedon alum Amy Acker (Angel, Dollhouse) shows up in her lab coat. I think Acker has kept the same wardrobe from her days on Angel and Dollhouse. The audience has no clue what is going on. After Acker appears on screen, it opens up numerous possibilities that these three characters are working at a research lab, at a government agency, or any other possibility that could cross a person’s mind. This question is eventually answered. Fran Kraz (Dollhouse), another Whedon alum, portrays drug smoking Marty. He is smoking an interesting bong when he first arrives on the scene. He is the funniest character in the movie and is one of the five friends who go on vacation together. Marty and the other friends, who are portrayed by Kristen Connolly (As the World Turns), Chris Hemsworth (2009s Star Trek), Anna Hutchison (Wild Boys), and Jesse Williams (Grey’s Anamony), are introduced after the interesting set-up of the introduction of the movie’s title. The other known face in the movie is Hemsworth who audiences will know as the title character in Thor. He will be back in theaters in May when Whedon’s The Avengers come out. He was filming this movie in 2009 when he received the title role in Kenneth Branagh’s Thor. Tom Lenk (Buffy, Angel), another Whedon alum, makes an appearance in the movie playing a minor character, Ronald the Intern. Just like any horror movie, you will start liking these characters and wish they could all survive, but you know that won’t happen. This is a horror movie after all and when you start out with five characters, you know that most of them will be dead by the end of the movie. The movie has many great moments in it. There is one scene where all these monsters are locked up then get freed. There are recognizable monsters like the Wolfman, a giant cobra and this evil looking Transformer-type with multiple sawblades. When these monsters break free and people began to die, it is reminiscent of the Buffy episode, “Primeval,” where all hell breaks loose in the Initiative. This is the one scene in the movie that will require multiple viewings just to see every single creature causing mayhem. 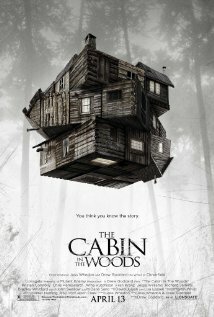 If you like Joss Whedon’s Buffy the Vampire Slayer and Angel, you will love The Cabin in the Woods. It is filled with his style of humor and horror mixed together in one entertaining movie. This review is vague so it won’t ruin the movie for you and because one of the joys of this movie is experiencing it for the first time. Just sit back and enjoy the ride Whedon and Goddard take you on. I’m a Whedon fan. Loved Buffy. Loved Angel. Was intrigued by Dollhouse but it never really got far off the ground. Excited for The Avengers. And I had high hopes for The Cabin in the Woods which have, it seems, been met! Thanks for the review. Glad you enjoyed the review and the movie. I will definitely buy it when it comes out on dvd.